Want to improve the state of the environment, your health, and your wallet all at the same time? Eating seasonal food will do just that! As Americans become more and more informed about how they get their food—from what goes into it to where it comes from—many people are making the decision to eat food that is in season, or at its peak growth for the year. Whether the decision is made for health reasons, moral reasons, or something else, there are many benefits to eating seasonal food! Taste: Food grown in season isn’t typically grown in a greenhouse, so it tends to taste fresher. Cost: Because seasonal food can be grown locally, there are no import costs, which in turn makes the food cheaper when it hits the shelves. Variety: As the seasons change, you get to eat many different foods. Environment: Eating food that's in season helps to lessen the unnecessary travel involved as food is delivered to grocery stores (which saves energy). Also note that seasonal food that is grown organically is grown in a sustainable way. Health: Because seasonal food is at the best quality it will be at any point in the year, it is rich in nutrients. Some foods that are in season for fall are commonly known—for example, apples and pumpkins. You may be unaware, however, that the list of fall foods is actually quite large! I’ve put together this list based on a graphic from fitssentialliving.com. What else will be in season this winter? To close out the list, here are some foods that will be in season before we know it! How can I remember what foods are in season? 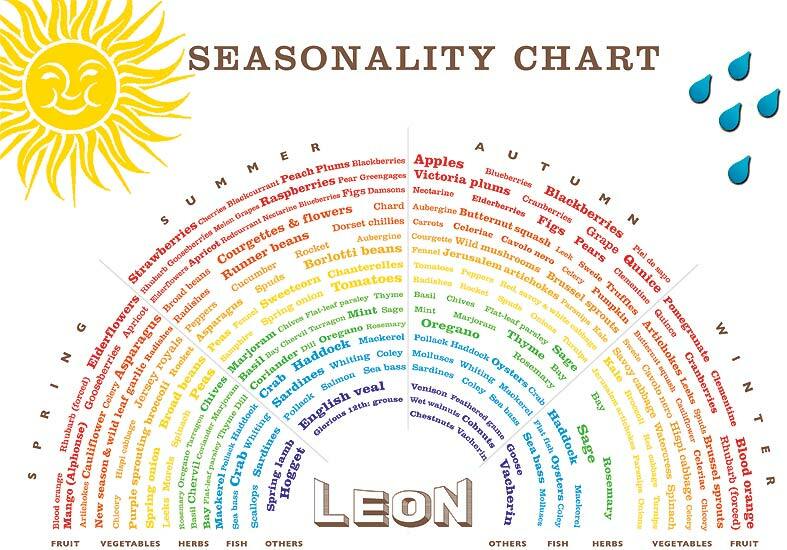 Many websites offer a visual way to remember what foods are in season by designing cool graphics that let shoppers know what to look for in stores. I really like the one below (from theguardian.com) because not only is the organization easy to follow, it also comes in a PDF version that you can print for your refrigerator.